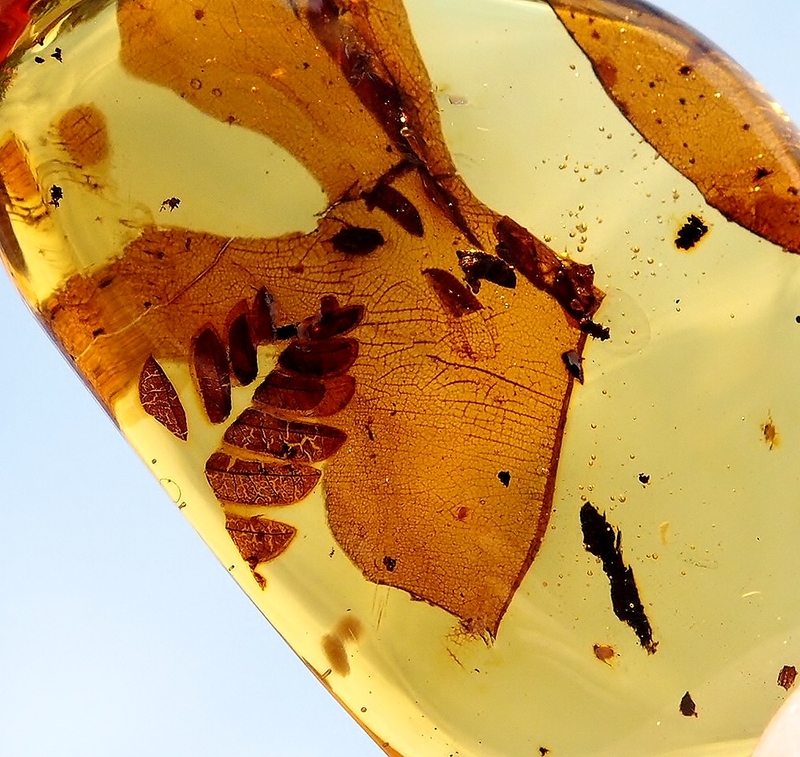 Amber is the paleontologists and entomologists dream time capsule. 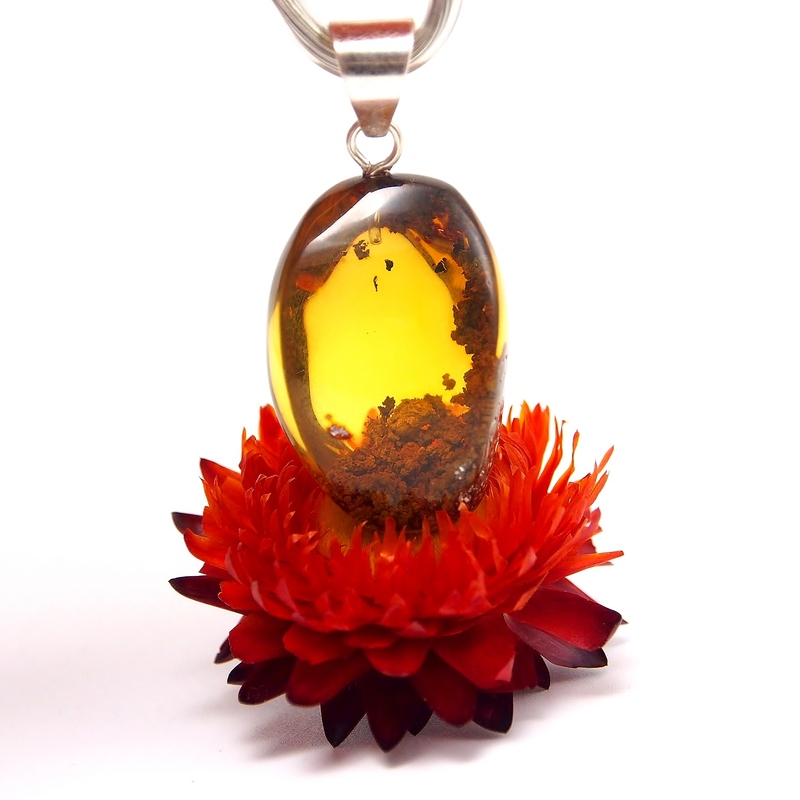 Natural, organic amber is fossilized tree resin that often has encased and preserved bits and remnants of ancient Life. Amber with inclusions offers scientists a sneak peak into the ancestry of modern day plants, insects, and other animals. Sticky, oozing resin flowing from trees millions of years ago- whether from the natural process of the tree, or initiated by glacial or fire activity- gathered all kinds of forest Life in it’s path. What gets stuck in this semi-liquid resin generally doesn’t get unstuck. The resin hardens as it evaporates. When it ends up in the proper conditions and enviornment to fossilize, it encapsulates forevermore whatever it consumed on it’s way down. Throughout the Cretaceous and Miocene eras… roughly 100-15 million years ago, amber has held captive a large variety of flora and fauna. Plant matter including twigs, sticks, leaves, needles, bits of bark, flowers, as well as lichen, moss, and fungi have been found in amber samples. Mainly the ancestors of small insects such as spiders, ticks, flies, bees, fleas, termites, mosquitos, ants, etc. would get trapped in the resin. 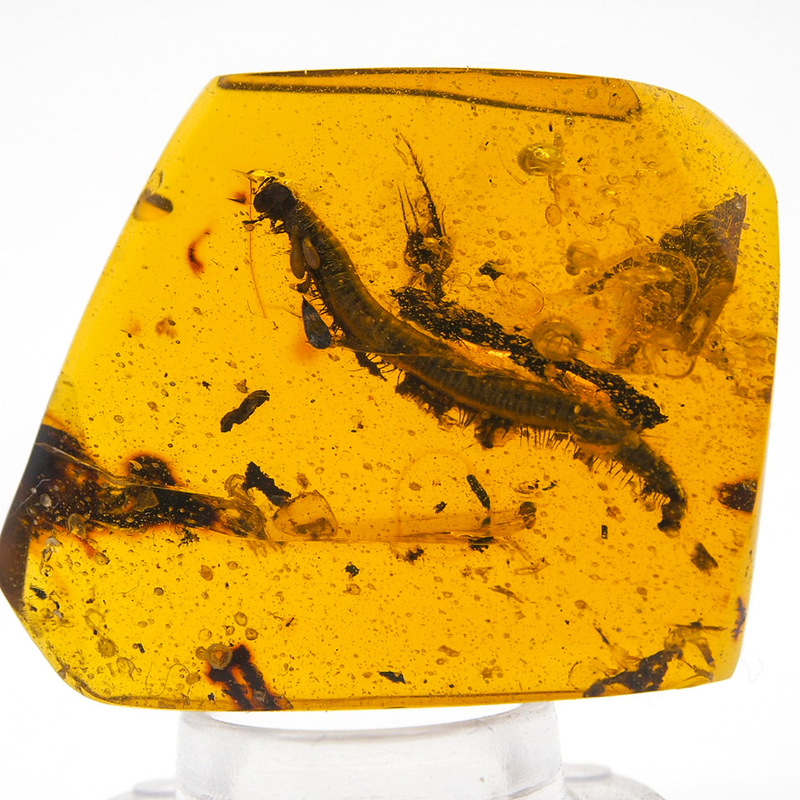 Specimens with scorpions, lizards, small birds, eggs, nests, feathers, and mammalian hair have also been found in amber worldwide. A remarkable find from Canada contains filament-like feathers from dinosaurs of the Cretaceous age, dated at about 80 million years old! 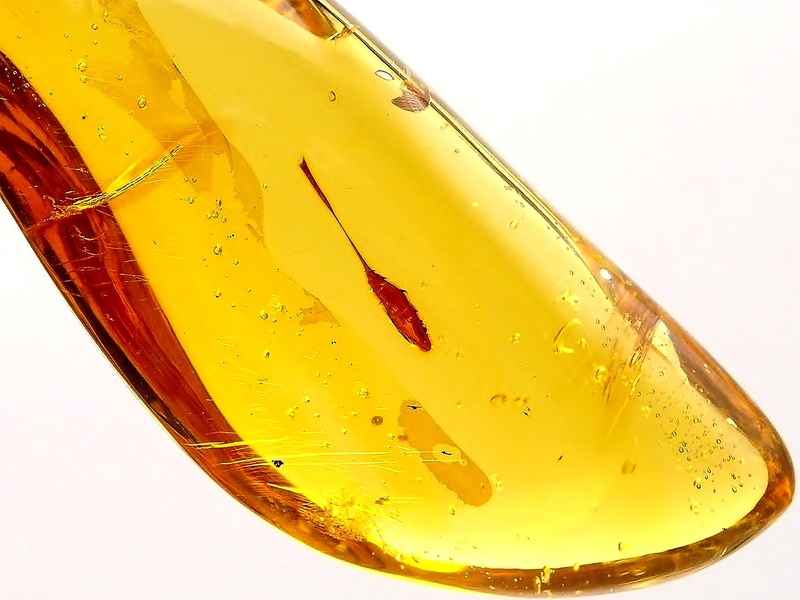 Amber can also contain enhydros. 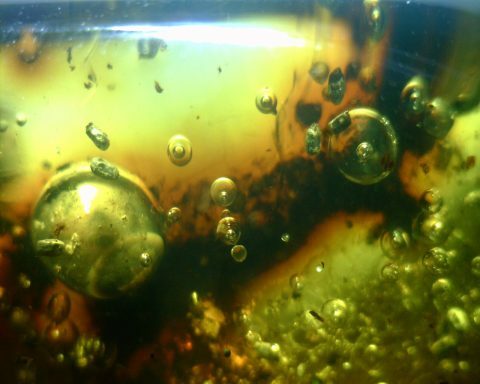 An enhydro is a bubble with air and water trapped in it. 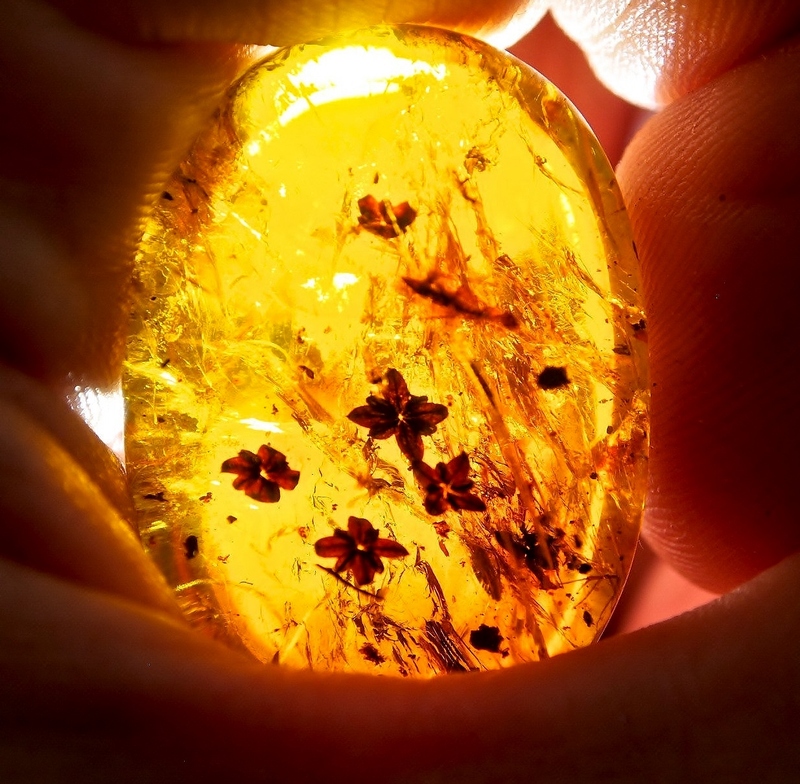 Amber with enhydros are truly fascinating specimens. The air or water bubble within it moves when rotating the piece! They’re super fun to examine. Kids and collectors especially love them. 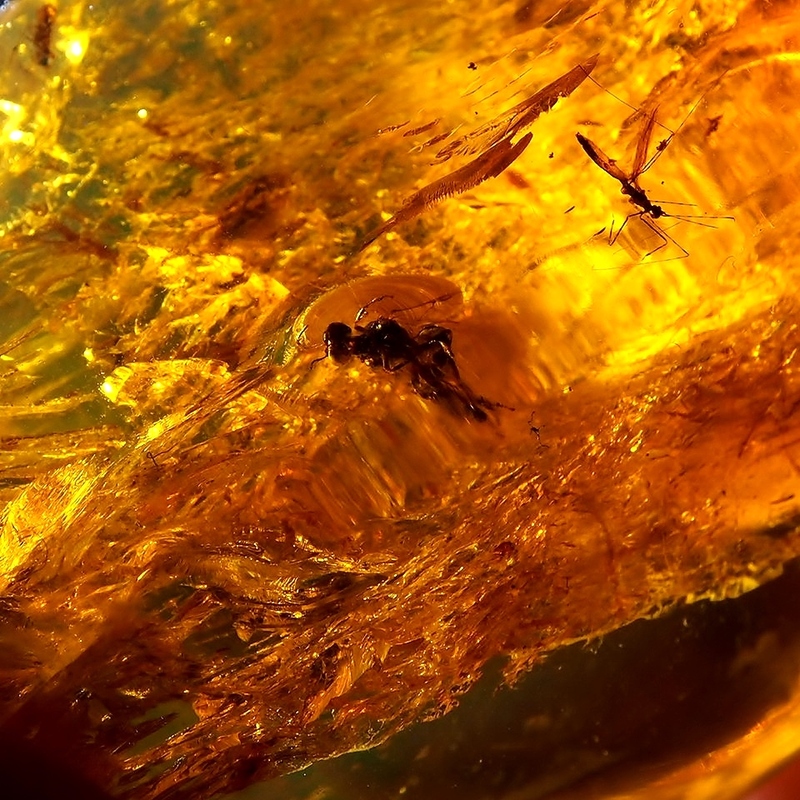 When looking at a fossilized animal engulfed in amber, it appears as if it has been completely preserved in the resin, but in fact, it is only a shell of itself. The organs inside have completely decomposed, but the outside stucture, or shell, is wholly intact. Minute details are viewable down to tiny strands of hair, scales, and antennae. 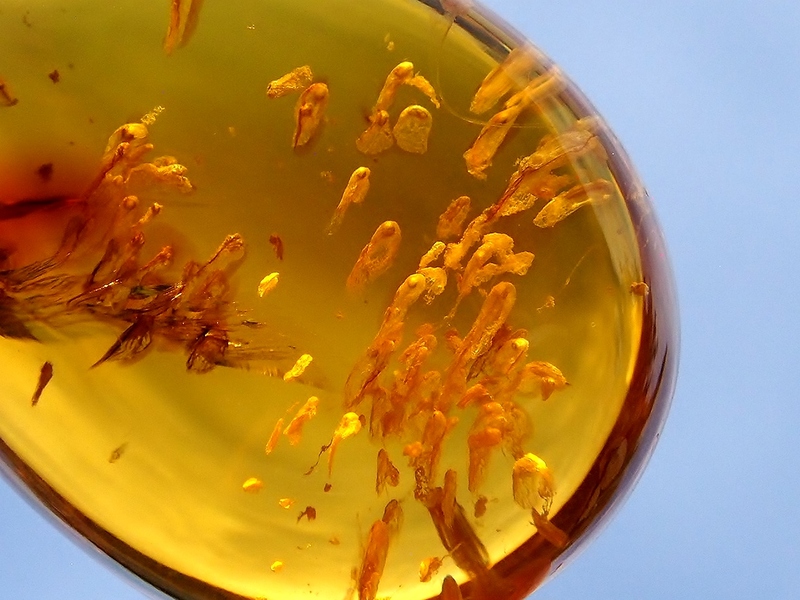 Though this is very exciting to many scientists, the Jurassic Park myth of retrieving viable DNA from a prehistoric animal trapped in amber, is just that- a myth. Before blindly cutting into a chunk of amber, one must be mindful of possible inclusions. Characteristic flow lines could indicate the presence of something interesting. Sometimes amber we procure may not look like anything special, but once we open it up we find something extraordinary hidden within. Polishing a window on a raw piece and using a light tray or flashlight to see what’s inside is good way to check for inclusions. Using a flashlight to view an ant and mosquito in Chiapn amber. When we cut amber that has an inclusion we need to be careful not to damage it. We take special attention, working little by little when shaping and polishing. Overall, it takes an expert eye to recognize, cut, and present an inclusion piece in the best possible way. Some truly fantastic inclusion specimens have come out of the amber mines near Simojovel here in Chiapas. A few worth mentioning include: a spider eating a fly; a scorpion fighting with ants; large populations of a colony of ants and of termites engulfed in a chunk of amber; ancient orchid flowers; milipedes; and even mushrooms. World renowned mycologist Paul Stamets took special interest in seeing our mushroom inclusion pieces at one of our expos at the 2018 Tucson Gem and Mineral Show. Another scientist, Curator of Entomology from the Natural History Museum of Los Angeles County, Dr. Brian Brown, regularly comes to our warehouse in Tucson to study our collection of insect inclusions. 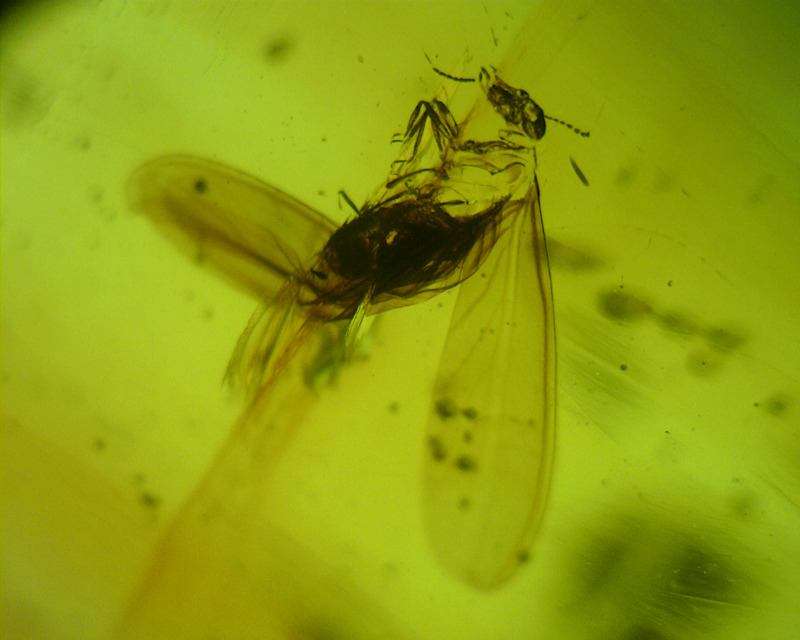 We’re proud to say he has found newly discovered species in our samplings of Mexican amber. If you’re curious about his work, you can find a ton of info from his research here. Based on our own experience of offering these wonderful little time capsules, it’s clear how valuable these ancient records of flora, fauna, and fungus/mycobionts are to the scientific and academic communities. Currently we have a smorgasbord of amber with inclusions on our online shops. We offer full polished pieces, cabochons, and pendants with an array of insects, plant and botanical matter, as well as enhydros.